Edited by Claude Royet-Journoud, Zuk was published monthly by Emmanuel Ponsart's Editions Spectres Familiers out of Le Revest-les-Eaux, France. The precision of Zuk is unparalleled in poetry magazines of the era: each of the twenty-four issues published between October 1987 and September 1989 featured a tightly constructed interplay of short works of poetry. In these pages, the reader may find an intimate conversation among poets in the tradition of Louis Zukofsky on both sides of the Atlantic. 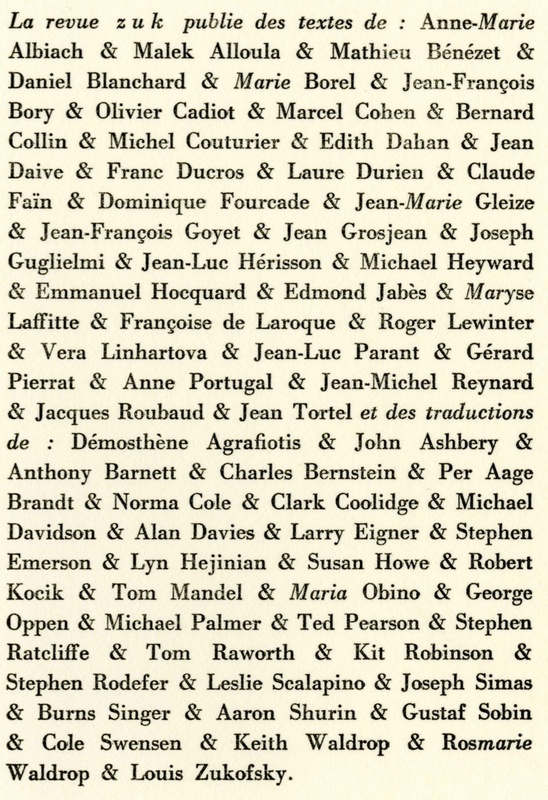 With just four slender pages to each issue, the magazine published works in French alongside translations of new works by poets loosely associated with Language poetry in the United States. Each issue consists of a single sheet of paper, folded to measure 6.3 x 4.3 inches. Five hundred copies were printed per issue. The text was set in size eight font. This Reissues collection of Zuk also features selected ephemera mailed out with the magazine, including three special inserts devoted to single-author publications. For more information, see “La poésie au format Zuk,” an interview between Jacqueline Pluet and Clade Royet-Journoud, translated by Abigail Lang on Reissues Commentary.